Gaylord Jackson Perry (born September 15, 1938) is a former Major League Baseball right-handed pitcher. He pitched from 1962 to 1983 for eight different teams. During a 22-year baseball career, Perry compiled 314 wins, 3,534 strikeouts, and a 3.11 earned run average. He was elected to the Baseball Hall of Fame in 1991. Perry, a five-time All-Star, was the first pitcher to win the Cy Young Award in each league, winning it in the American League in 1972 with the Cleveland Indians and in the National League in 1978 with the San Diego Padres. He is also distinguished, along with his brother Jim, for being the second-winningest brother combination in baseball history—second only to the knuckleballing Niekro brothers, Phil and Joe. While pitching for the Seattle Mariners in 1982, Perry became the fifteenth member of the 300 win club. Despite Perry's notoriety for doctoring baseballs (e.g. throwing a spitball), and perhaps even more so for making batters think he was throwing them on a regular basis – he even went so far as to title his 1974 autobiography Me and the Spitter – he was not ejected for the illegal practice until August 23, 1982, in his 21st season in the majors. Like most pitchers, Perry was not renowned for his hitting ability, and in his sophomore season of 1963, his manager Alvin Dark is said to have joked, "They'll put a man on the moon before he hits a home run." There are other variants on the story, but either way, on July 20, 1969, just an hour after the Apollo 11 spacecraft carrying Neil Armstrong and Buzz Aldrin landed on the moon, Perry hit the first home run of his career. Gaylord Perry was born in Williamston, North Carolina, and named after a close friend of his father's, who died while having his teeth pulled. He studied at Campbell University in his home state. The current mascot of the Campbell Fighting Camels and Lady Camels is Gaylord the Camel, named in honor of Gaylord Perry. Perry claims he was taught the spitball in 1964 by pitcher Bob Shaw. Perry had a reputation throughout his career for doctoring baseballs, and was inspected on the mound by umpires and monitored closely by opposing teams. On August 23, 1982, he was ejected from a game against the Boston Red Sox for doctoring the ball, and given a 10-day suspension. Perry reportedly approached the makers of Vaseline about endorsing the product and was allegedly rebuffed with a one-line postcard reading, "We soothe babies' backsides, not baseballs." Former manager Gene Mauch famously quipped "He should be in the Hall of Fame with a tube of K-Y Jelly attached to his plaque." Gene Tenace, who caught Gaylord Perry when they played for the San Diego Padres, said: "I can remember a couple of occasions when I couldn't throw the ball back to him because it was so greasy that it slipped out of my hands. I just walked out to the mound and flipped the ball back to him." Perry used his reputation to psyche out the hitters as well. As he looked in to his catcher for the pitch selection, Perry would touch various parts of his head, such as his eyebrows and his cap. In this manner, he may or may not have been applying a foreign substance to the ball on any particular pitch. Reggie Jackson was so upset after striking out against Perry one time that Jackson was ejected from the game. Jackson returned from the dugout with a container of Gatorade, splashing Gatorade onto the field while yelling at the umpire that Perry should be allowed to use the Gatorade on the baseball. The spitball was not his only method for upsetting batters. Sports Illustrated‍ '​s Joe Posnanski wrote of Perry, "My favorite trick pitch of his was the old Puffball, where he would load up on rosin so that a puff of white smoke would release while he threw his pitches. This was made illegal somewhere along the way (because of Perry, of course), but it’s so awesome — it’s like the sort of thing one of the villains on the old Batman TV show would do." Perry played semi-professionally in Alpine, Texas at Kokernot Field in the early 1950s for the Alpine Cowboys. Bobby Biedermann was his catcher and roommate. Perry was signed by the San Francisco Giants on June 3, 1958 for $90,000, which was a big contract at the time. He spent 1958 with the St. Cloud, Minnesota team in Class A Northern League, compiling a 9–5 record and a 2.39 ERA. In 1959 he was promoted to the Class AA Corpus Christi Giants, where he posted a less impressive 10–11 record and 4.05 ERA. He remained with the team as they became the Rio Grande Valley Giants in 1960, and an improved ERA of 2.82 earned him a promotion to the Class AAA Tacoma Giants for the 1961 season. At Tacoma, he led the Pacific Coast League in wins and inning pitched in 1961. He had a brief call-up to the Major Leagues in 1962, making his debut on April 14 against the Cincinnati Reds. He appeared in 13 games in 1962, but had a high 5.23 ERA and was sent back down to Tacoma for the remainder of the year. With the addition of Perry, Bill James called that 1962 Tacoma squad, which featured numerous future major league players, the best minor league lineup of the 1960s. After his brief call-up in 1962, Perry joined the Giants in 1963 to work mostly as a relief pitcher that year, posting a mediocre 4.03 ERA in 31 appearances. Nevertheless, in 1964 he was given the opportunity to join the starting rotation, finishing with a 2.75 ERA and a 12–11 record, both second best for the Giants that year behind Juan Marichal. In 1965 his record was 8–12, and with two full seasons as a starter, his 24–30 record attracted little national attention. Perry's breakout season came in 1966 with a tremendous start, going 20–2 into August. Perry and Marichal became known as a "1–2 punch" to rival the famous Koufax/Drysdale combination of the Los Angeles Dodgers. While Marichal was NL Player of the Month in May, Perry was so named in June (5-0, 0.90 ERA, 31 SO). He played in his first All-Star game, but after August, he slumped the rest of the season, finishing 21–8, and the Giants finished second to the Dodgers. Marichal missed much of the 1967 season with a leg injury, and Perry was thrust into the role of team ace. While he finished the season with a disappointing 15–17 record, he had a low ERA and allowed only 7 hits per 9 innings pitched. Perry had similar numbers in 1968: he posted a 16-15 record, but with a then-career-best 2.45 ERA on a Giants team that finished second to the St. Louis Cardinals. On September 17 of that year, two days after his 30th birthday, Perry no-hit the Cardinals and Bob Gibson 1-0 at Candlestick Park. The lone run came on a first-inning home run by light-hitting Ron Hunt—the second of the only two he would hit that season. The very next day, the Cardinals returned the favor on the Giants on a 2–0 no-hitter by Ray Washburn—the first time in Major League history that back-to-back no-hitters had been pitched in the same series. In 1969, Perry led the league in innings pitched, but the Giants finished second in the pennant race for the fifth straight season. Perry took over as the Giants' ace in 1970, and led the league both in wins (23) and innings pitched (328). Perry's strong 1970 performance salvaged the Giants season, helping them finish above .500 but in third place. In 1971, the Giants finally won their division, with Perry posting a 2.76 ERA. In what would be his only two postseason appearances, Perry won one game and lost the other against the Pittsburgh Pirates. Before the 1972 season, the Giants traded the then 32-year-old Perry and shortstop Frank Duffy to the Cleveland Indians for 29-year-old flamethrower Sam McDowell, the ace of the Indians' staff. After that trade Perry went on to win 180 more games in his career while McDowell won only 24 more. Perry went 24–16 in 1972 with a 1.92 ERA and 1 save, winning his first Cy Young award. He stood as the only Cy Young winner for Cleveland until 2007 (CC Sabathia). He was named AL Player of the Month in June 1974 with a 6-0 record, 1.00 ERA, and 39 strikeouts, thus becoming the first player to win the award in both leagues (the AL had only begun to issue the award in April of that season). Perry continued as Cleveland's staff ace until 1975. He went 70–57 during his time in Cleveland, but the team never finished above 4th place. Perry accounted for 39% of all Cleveland wins during his tenure. Tensions between him and player-manager Frank Robinson led to Perry's trade to Texas in June 1975. Gaylord Perry remained as Cleveland's last 20-game winner (21 wins in 1974), until Cliff Lee in 2008. On June 13, 1975, at the start of a three-game series with the Texas Rangers, the Indians traded Perry to the Rangers in exchange for pitchers Jim Bibby, Jackie Brown, and Rick Waits. Perry was feuding with Indians player/manager Frank Robinson. Perry would win nearly 80 more games in his career than the three combined. With the Rangers, Perry formed a one-two punch with Ferguson Jenkins, with Perry earning 12 wins, and Jenkins 11, during the remainder of 1975. However, the Rangers, who had finished 2nd in the AL West in 1974, slipped to 3rd place that year. The next year, with Jenkins moving to Boston, the 37-year-old Perry became the staff ace, winning 15 games against 14 defeats. The Rangers, however, slipped to 4th place in the AL West. But then, in 1977, the Rangers surged to 2nd place in the AL West, winning 94 games, a total that the franchise would not surpass until 1999. Perry again won 15 games, this time against only 12 defeats, in a rotation that included double-digit winners Doyle Alexander, Bert Blyleven, and Dock Ellis. Before the 1978 season San Diego acquired Perry from Texas in exchange for middle reliever Dave Tomlin and $125,000. The 39-year-old Perry wound up winning the Cy Young Award going 21–6 for San Diego while the 29-year-old Tomlin never pitched for Texas and pitched barely 150 innings the rest of his career. Perry's 21 wins in 1978 accounted for 25% of the club's victories all year long, and he became the first pitcher to win Cy Young awards in both leagues. In this season he became the third pitcher to strike out 3,000 batters, accomplishing the feat two weeks after his 40th birthday. 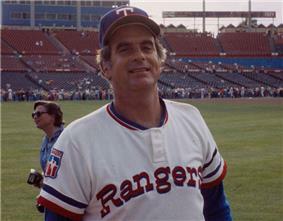 In 1979, Perry posted a 3.05 ERA and an 12–11 record before quitting the team on September 5, saying he would retire unless the club traded him back to Texas. The Padres traded Perry to the Texas Rangers on February 15, 1980. In 1980, Perry posted a 6–9 record and 3.43 ERA in 24 games with Texas before being traded to the Yankees on August 13, 1980 for minor leaguers Ken Clay and a player to be named later (Marvin Thompson). Many Yankees players had complained about Perry during his stints with the Rangers, and the club even used a special camera team to monitor his movements during one of his starts at Yankee Stadium. Perry finished the season with a 4–4 record for the Yankees. Perry's contract was up after the 1980 season and he signed a one-year, $300,000 contract with the Atlanta Braves. During the strike-shortened 1981 season, Perry, the oldest player at the time in Major League baseball, started 23 games (150.7 innings) and had an 8–9 record. The Braves released Perry after the season, leaving him three victories short of 300. After being released by the Braves, Perry was unable to find interest from any clubs, and missed his first spring training in 23 years. He eventually signed with the Seattle Mariners, where he acquired the nickname "Ancient Mariner", and won his 300th game on May 6, 1982, the first pitcher to win 300 since Early Wynn did so in 1963. On August 23 of that year, he was ejected from a game against the Boston Red Sox for doctoring the ball, and given a 10-day suspension. It was the second time Perry had been ejected in his entire career, and it was his first ejection for ball doctoring. After starting the 1983 season 3–10, Perry was Baltimore Orioles on August 19. In 1983, he became the third pitcher in the same year to surpass longtime strikeout king Walter Johnson's record of 3,509 strikeouts. Steve Carlton and Nolan Ryan were the others. He announced his retirement on September 23, 1983. Perry retired in 1983 after pitching for eight teams (the San Francisco Giants, Cleveland Indians, Texas Rangers (twice), San Diego Padres, New York Yankees, Atlanta Braves, Seattle Mariners and Kansas City Royals). Perry retired to his 500-acre (2.0 km2) farm in Martin County, North Carolina where he grew tobacco and peanuts, but had to file for bankruptcy in 1986. He briefly worked for Fiesta Foods as a sales manager, and later in the year Limestone College in Gaffney, South Carolina chose Perry to be the College’s first baseball coach. Perry was there until 1991 when he retired. Despite his admission of illegal pitches he was elected to the Hall of Fame in 1991 and was nominated as a finalist for the Major League Baseball All-Century Team. In 1999 The Sporting News ranked him 97th on their list of the 100 Greatest Baseball Players. Perry supported the Republican Party, campaigned for Jesse Helms and contemplated a bid for Congress himself in 1986. 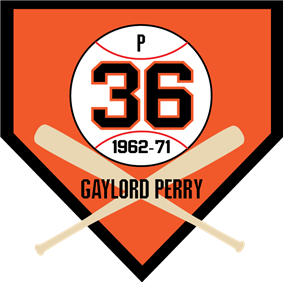 On July 23, 2005 the San Francisco Giants retired Perry's uniform number 36. Perry was inducted into the Bay Area Sports Hall of Fame on March 9, 2009. He was honored on April 9, 2011 at AT&T Park with a 2010 World Series World Series ring along with other San Francisco Giants greats Willie McCovey, Orlando Cepeda, and Willie Mays. Of the four, only Mays, as a member of the 1954 team, had previously received a World Series ring from playing for the Giants. He was honored again on April 18, 2015 at AT&T Parkwith a 2014 World Series ring along with Mays, McCovey, Cepeda, and Juan Marichal. 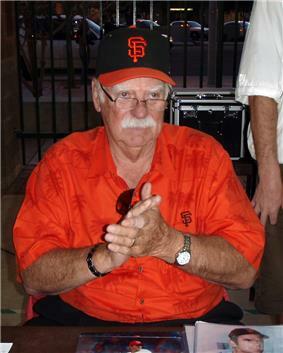 Gaylord Perry's number 36 was retired by the San Francisco Giants in 2005. Due to the number of games Perry lost (265) and lack of postseason glory, the Washington Post called Perry's bid for the Hall of Fame "dubious". Bill James lists Perry as having the 10th best career of any right-handed starting pitcher, and the 50th greatest player at any position. In 1999, The Sporting News placed Perry at number 97 on its list of "The 100 Greatest Baseball Players." Perry is one of five pitchers to win the Cy Young Award in both the American and National League (Pedro Martínez, Roger Clemens, Randy Johnson, and Roy Halladay being the others). He held the record for most consecutive 15-win seasons since 1900 with 13 (1966–1978) and was 2nd all-time to Cy Young, who had 15 (1891–1905). Greg Maddux surpassed both men, with 17 in a row (1988–2004). Perry's wife, Blanche Manning Perry, died on September 11, 1987 when a car ran a stop sign and hit her car broadside on U.S. Route 27 in Lake Wales, Florida. Daughters: Amy, Beth, and Allison. Son Gaylord Jackson "Jack" Perry, Jr. died of leukemia in 2005. His nephew, Chris, is a professional golfer who has won a tournament on the PGA Tour. ^ Light, Jonathon (2005). "Perry, Gaylord". The Cultural Encyclopedia of Baseball. p. 699. ^ a b James, Bill (2001). The New Bill James Historical Baseball Abstract. ^ a b c Berkow, Ira (March 1, 1982). "Gaylord Perry: The Lonely Quest For Victory No. 300". ^ Saracena, Joe (June 19, 2003). "Clemens should save pitches for mound, not Hall of Fame". ^ a b "SPORTS PEOPLE; More on the Perry Case". ^ a b c MacKay, Joe (2003). The Great Shutout Pitchers: Twenty Profiles of a Vanishing Breed. McFarland & Company. pp. 177–178. ^ . "Gaylord Perry | SABR". Bioproj.sabr.org. Retrieved March 27, 2013. ^ a b Naiman, Joe and Porter, David (2003). "Gaylord Perry". The San Diego Padres Encyclopedia. Sports Publishing LLC. p. 296. ^ "Gaylord Perry leaves Padres". ^ "Yanks Lose To White Sox, 4–1; Perry Obtained From Rangers". ^ Gross, Jane (August 15, 1980). "Yanks Greet Perry, A Venerable Newcomer". ^ a b "Gaylord Perry statistics". Baseball Reference. Retrieved April 20, 2008. ^ "Agreement With Perry, 42, Is Confirmed by Braves". ^ "SPORTS PEOPLE; Quest for No.300". ^ "Perry Ends His Career After 21 Years, 314 Wins". ^ Boswell, Thomas (October 1, 1983). "Three Great Careers Ending, and an Era". ^ Trott, William C. (August 18, 1986). "FROM BASEBALL TO BANKRUPTCY". ^ ""You can't eat and farm too" – Gaylord Perry". ^ "Padres Acquire Randa From the Reds". ^ Crumpacker, John (March 10, 2009). "Bay Area Sports Hall of Fame Inductions". ^ Boswell, Thomas (August 27, 1985). "To Combat the New Era of Statistics Inflation, Baseball Needs a New Barometer". ^ "TSN Presents – Baseball's 100 Greatest Players". sportingnews.com. Retrieved February 15, 2007. ^ "Wife of Gaylord Perry killed in wreck".